Remember the days when many of us had physically demanding jobs, we made far fewer car journeys and the internet and other technologies hadn’t given us so many excuses to sit still? This isn’t just an opportunity for nostalgia; it’s important to remind ourselves of the way things were before we designed physical activity out of our everyday lives. So how can we start designing it back in? Local transport planners, directors of public health and local politicians are at the forefront of work to tackle inactivity, a problem that costs £7.4 billion a year to business and wider society. In this blog I want to highlight a briefing which helps communities work together to promote active travel, re-designing our towns and cities so they become places where walking and cycling are the norm, providing healthier, safer and cleaner environments for all. 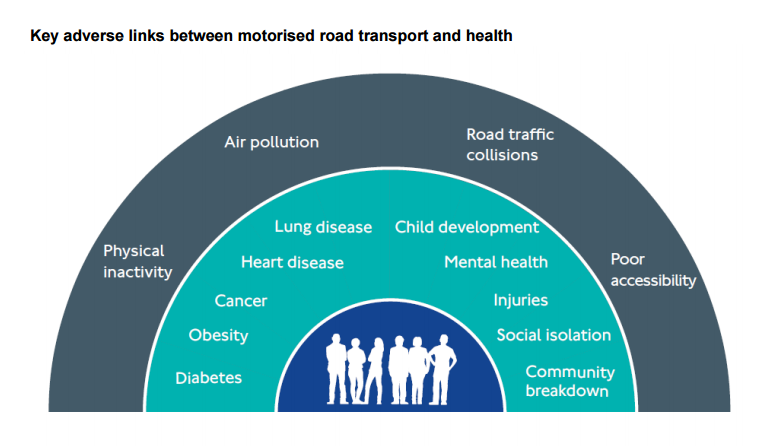 I won’t spend time outlining the wider benefits of exercise as the full package of Health Matters content does this well, but I do want to discuss road transport and health. Because whilst motorised road transport provides clear benefits to society including comfort and convenience it doesn’t mean there is no cost. Our car journeys lead to increased disease burden due to reduced physical activity along with road accidents, air pollution, noise and even reduced social cohesion and increased social isolation. Conversely making our daily journeys on foot or on a bike continually boosts our health, as the easiest and most acceptable forms of physical activity are those that can be built into everyday life. 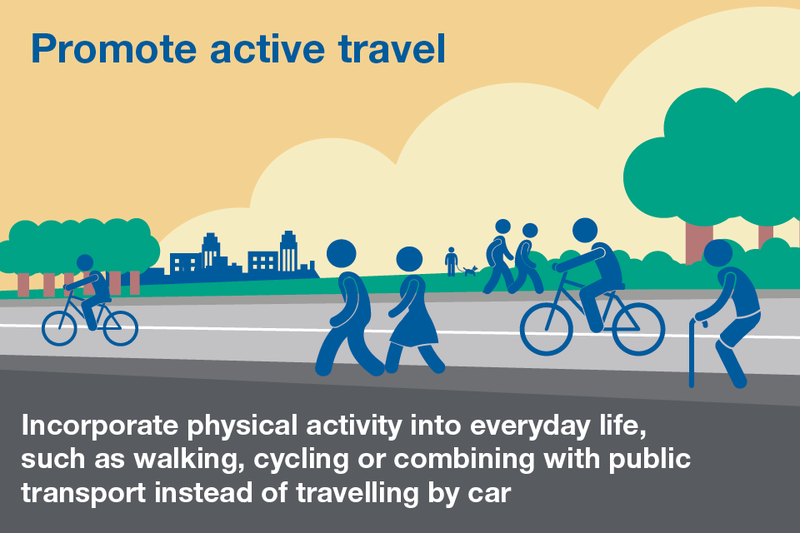 Indeed recent analysis of data from the Active People Survey has shown that people who cycle for travel purposes (ie rather than simply for recreation) are four times as likely to meet physical activity guidelines as those who don’t. With all this in mind promoting active travel sounds simple, but of course it can be challenging when we work in day-to-day reality, with competing priorities and stretched budgets. As we say in the briefing “there has never been a better time for public health and transport professionals to work together to shape the urban form to improve health, the economy and the environment”. It’s certainly within the power of local transport/planning professionals to agree policies and initiatives that make the most of local community assets, facilities and resources and build walking or cycling into our daily routines. Planners can look at the design of new developments, prioritise pedestrians and cyclists when improving or maintaining our streets or reallocate road space to support walkers or cyclists. There are examples where just by redesigning a roundabout or a junction the area is transformed, people can move around in new ways and new businesses crop up. So if you’re a decision maker at local level, whether in public health or transport, please do take a look at the briefing. You’ll find key facts to help you make the case for action, information on the importance of active travel to different groups (from children to people with disabilities) and practical steps to achieve change. We also provide case studies from Bristol and Cambridgeshire explaining their approach. Everyone benefits from active travel. For each individual, it boosts physical and mental health, for our health service it reduces the heavy burden of treating preventable illnesses and of course businesses see the benefit of a healthier workforce. And don’t forget the reduction in congestion, cleaner air, fewer road traffic collisions and potentially reducing the impact of climate change. This is great! Better infrastructure for walking and cycling would definitely encourage more people to be active and leave the car at home. So much better for our health and the environment. Very good initiative. Special plea for buses and trains to carry more bikes to allow combinations of sedentary and active commutes and leisure journeys. Plenty of American cities do this and so do buses in some wild areas of Britain. More please.